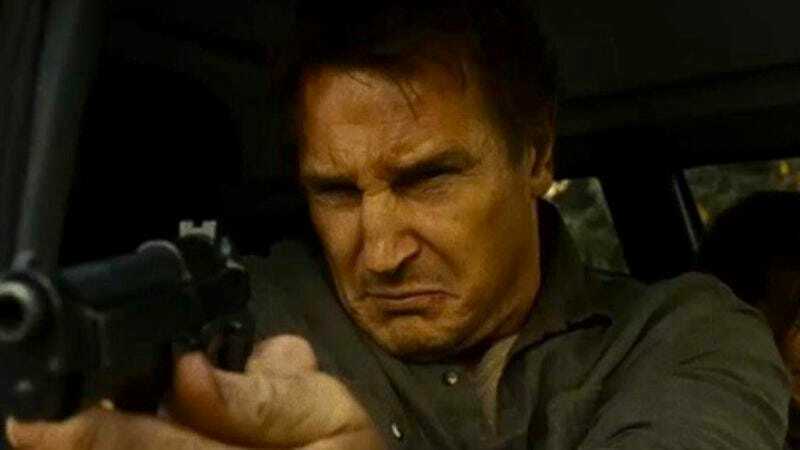 Last fall, the success of Taken 2 made Taken 3 an inevitability, even as Liam Neeson expressed skepticism that the formula could withstand it without being totally reversed—such as, say, offering Maggie Grace to the first country to claim her, like a Craigslisted futon. However, it seems producers have come up with a new perspective on the script that appeals to Neeson: looking at it from atop a giant pile of money. Deadline reports that Neeson is expected to accept $20 million to return for a third Taken that’s currently being scripted—keeping in mind writer Robert Mark Kamen’s earlier assertion that “we’ve taken everyone we can take” and it will therefore head “in another direction.” So, prepare to be surprised when Albanian mobsters shrink Neeson’s family using secret miniaturization technology, then inject them directly into his bloodstream, forcing Neeson to look for them inside himself. “I have a certain set of skills and so forth!” Neeson will scream into a feeding-back cellphone while punching himself in the throat, until he's at last allowed to stop this.